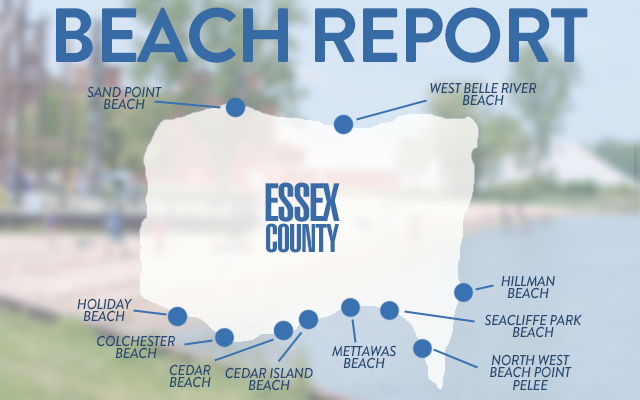 With summer vacation season kicking into high gear, windsoriteDOTca will once again be providing weekly beach reports every Wednesday. We will let you know which beaches are safe for swimming, and those that are not. Beach sampling will take place every Monday. If the beach is closed due to high E. coli levels, the beach will be resampled on Thursday of the same week. Beach water quality results from Monday’s sampling are posted on Wednesday during the summer. If the beach was resampled, results will be posted on Friday. Swimming is not recommended at West Belle River Beach in Lakeshore. No beaches are closed this week.